drops of snofleks - 雪片の物語*✲ﾟ*: EFSP eh? 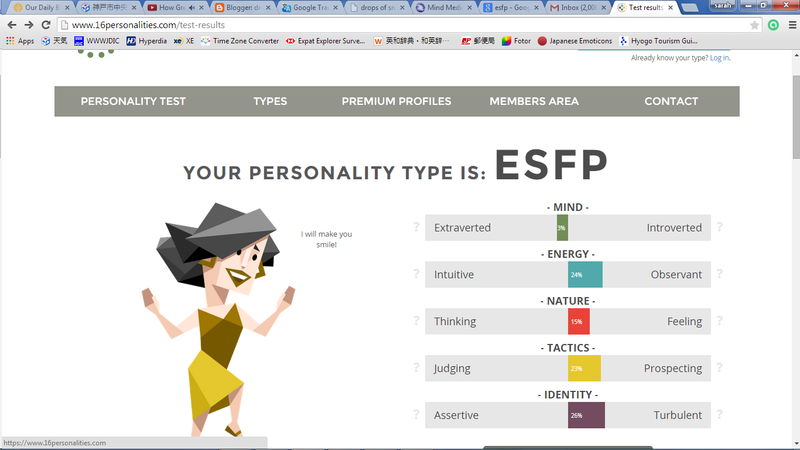 I've gone through various personality tests that I wonder if any would actually mean anything valuable. So I was feeling a bit sceptical when I found this in my inbox, and surprise, from, of all people, Ms Barbie. It gave quite an in-depth explanation of the personality type's strengths and weaknesses, and explored the areas of relationship, parenthood, career, friendships and workplace habits. I would say it's for the most part accurate, and I guess I have to work on how to balance the weaknesses against the strengths! Now, if I can find some time to reflect on the results... maybe on the plane this weekend?